Vous êtes ici : Accueil / Practical information / How to get here ? Loriol (N° 16), by RN104 Le Pouzin, Privas, follow direction Aubenas. Exit St. Privat/Ucel and follow Ucel. Montelimar-Nord (N° 17), and by RN102, Le Teil, follow direction Aubenas. Just before Aubenas at the roundabout, take RN104, direction St. Privat/Privas. Then, at the next roundabout, exit St. Privat/Ucel. In St. Privat, follow Ucel. Montelimar-Sud (N° 18), follow Viviers and Aubenas. Just before Aubenas at the roundabout, take RN104, direction St. Privat/Privas. 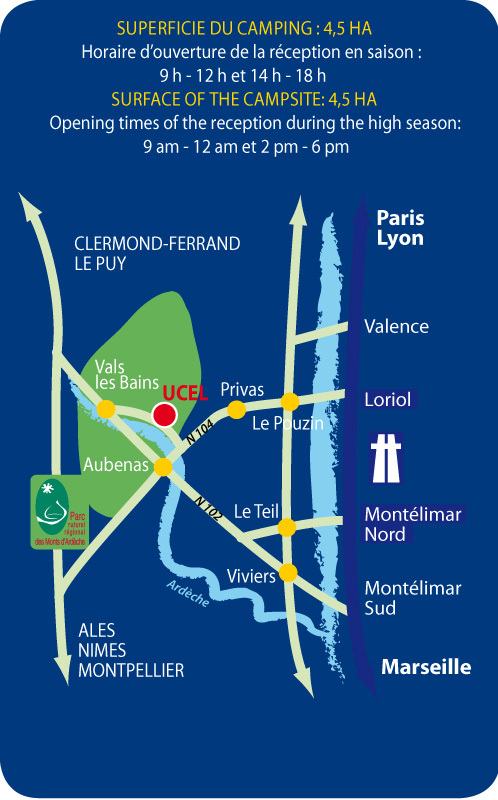 Then, at the next roundabout, exit St. Privat/Ucel. In St. Privat, follow Ucel. At the roundabout in Pont d’Ucel, follow Vals-les-Bains/Ucel. The campsite Domaine de Gil is located after 2 km at your left and, just after the village Ucel.